The Jakemans Stadium has a current capacity of 6,778. The Main Stand houses 1,323 seats. It is available solely for home supporters. There is an additional area at the front of the stand which can accommodate six disabled supporters. 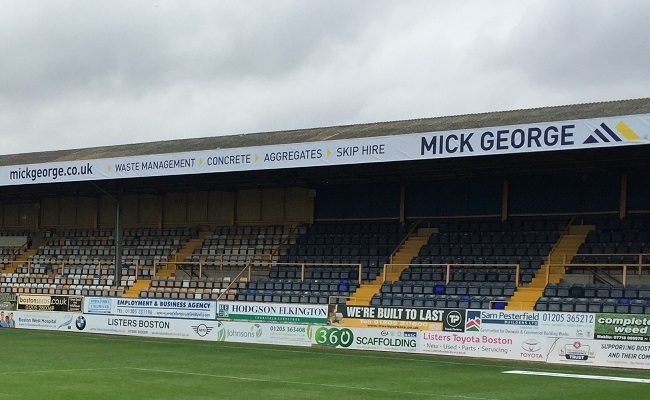 The Lincolnshire Co-operative Stand at the York Street end of the stadium has a capacity of 1,335, including space for visiting supporters in a segregated section. The stand features seating at the top, with terracing available below. The Spayne Road Terrace can house 2,064 spectators and runs the full length of the pitch (opposite the Mick George Stand). The Jakemans Stand is the popular end for home supporters — but is used to house visiting fans if sizeable travelling numbers are expected. The stand has a capacity of 2,050.